Say NO to dirty fuels and YES to clean energy! It's time to transition to a fossil free future. 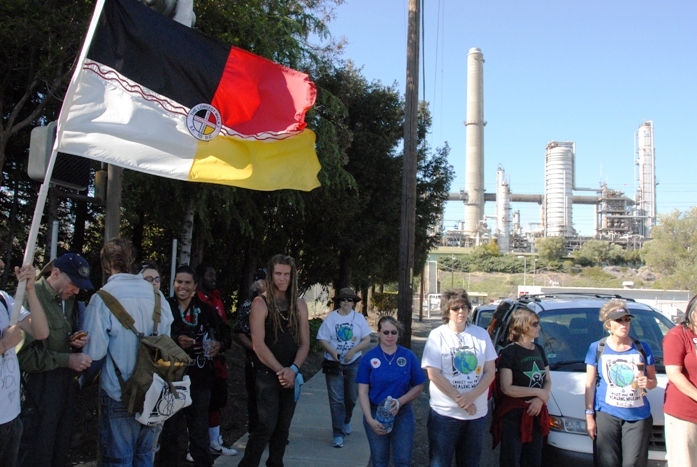 Join us for the second of four healing walks along the refinery corridor in Northeast San Francisco Bay. We will begin at the Martinez Waterfront Park (home of the Tesoro and Shell Refineries) and walk in prayer and conversation to 9th Street Park in Benicia (home of the Valero Refinery). 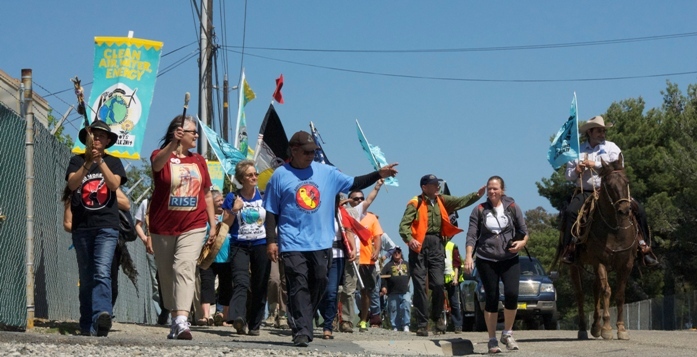 This series of healing walks were inspired to bring awareness to the refinery communities, invite community members to get to know one another, and to show support for a just transition beyond fossil fuels. Native American elders and community members will lead the walk, stopping to pray at certain places, including the water. We will from the Waterfront Park in Martinez to the 9th Street Park in Benicia, and will be walking over the Benicia/Martinez bridge. A flotilla of canoes and kayaks will be in solidarity on the Carquinez straights as we walk over the bridge. The walk is approximately 7 miles with support vehicles so that walkers can rest whenever they would like. There are also several places where walkers can join the walk along the route (continue reading for details of route). Around the last mile, walkers will be encouraged to begin imagining their own communities beyond fossil fuels and what they would ideally be like. Walkers will be invited to share those ideas with their own drawings on muslin at the end of the walk. The muslin squares will be sewn in to a quilt and shared at the next two walks on June 14 and July 12. Art from the first walk from Pittsburg to Martinez on April 12 will be exhibited. Two important considerations1.) Please bring your own lunch and snacks. Lunch will not be provided. 2.) At whatever point you decide to leave, you need to provide your own transportation back home. a donation for our expenses, if you wish. •Wear layers of comfortable clothing that you can use to adjust your temperature. • Check the weather and bring rain gear if there is a chance of precipitation. Please call (510) 619-8279 (keep this number handy during the walk). 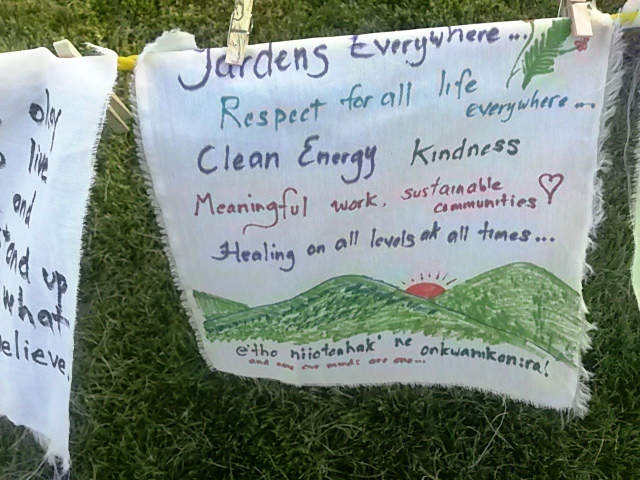 Non-violence agreement: At the beginning of the Healing Walk, we will ask you to sign an agreement to participate in this event in a non-violent manner, for the well-being of all involved, and out of respect for the tradition of Healing Walks. All participants in this Healing Walk are asked to agree to the following action guidelines and principles. Having this basic agreement will allow people from many backgrounds, movements and beliefs to work together. They are not philosophical or political requirements placed upon you or judgments about the validity of some tactics over others. These guidelines are basic agreements that create a basis for trust, so we can work together and know what to expect from each other. Can you chip in at least $5.00 to help with the costs of the Healing Walks? The Route: Possible Joining Points in BOLD - Times are approximate - Call (510) 619-8279 the day of the walk to find out exactly where we are! 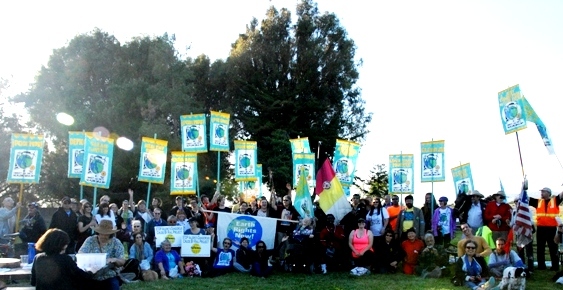 *11:45 am - Arrive at Bridgehead Road (foot of the Benicia/Martinez Bridge) - A good place to join us! Walk across the bridge - Flotilla of kayaks and canoes in the water in solidarity! *Vista Point: Prayer & Teach-in - A good place to join us! 1:30 - Leave Vista Point, retrace walk back to post bridge turn. Turn left away from bridge at the walkway. At STOP sign, turn left on Park Road. Join hands! Join hearts! Join us!